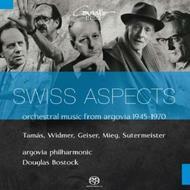 This recording presents an exciting cross-section of works from Argovia (Switzerland) which have been unjustly neglected in the concert hall. This is probably due in part to the fact that many Swiss composers were committed to a somewhat conservative neoclassical style, which was vehemently rejected by the avant-garde, particularly after the Second World War. The Argovia Philharmonic has used its 50th anniversary as an opportunity to devote itself to its musical roots. This exciting CD is a 'live' recording of the official gala concert held on the 28th April 2013.